Home » Posts » Phone Mounts » What’s a Phablet? Is your latest phone just a little smaller than a tablet but a little larger than a cell phone? If so, congratulations, you an owner of a phablet (we didn’t make this up, it’s now a category of device). The functionality of phablets approach and in some cases surpass tablets. Personally I feel a little strange using mine, feels a little like holding a tray up to your ear. I’ll get used to it. There are a lot of phablets out there. Samsung has the largest assortment with the Samsung Galaxy Note plus the S III/IV/V models. As if that wasn’t enough, they introduced the Samsung Galaxy Mega 6.3 which is a whopping 6.3 inches. 6.3 inches is pretty darn big and I don’t see how it can possibly fit in your pocket. Well I’m guessing that Apple must have been losing some sales to Samsung as the new Apple iPhone 6 Plus has encroached on the phablet category. Not quite as large as the Samsung Mega, this screen is “only” 5.5 inches across. Apparently this is becoming a big problem as the New York Times recently published an article about people complaining about that these larger phones can’t fit in their pocketbooks or pockets. They are also complaining about the difficulty in exercising with them ( guess they haven’t searched very hard because there are a log of armbands out there for larger phones such as the Arkon ARMBAND6). This is the MountGuys site so naturally we’re going to discuss mounting options. The problem with a phablet is it’s a little too large for a standard phone cradle and little too small for a tablet cradle. 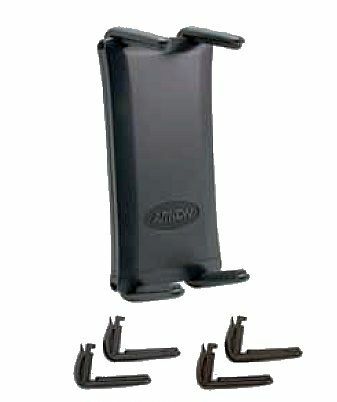 Our buddies at Arkon Resources have recently come out with their Slim Grip Ultra Cradle. It opens from 4.4 – 7.5 inches and grips your phablet tightly. The spring-loaded cradle features two legs on the top, another two on the bottom. The legs can be moved from side to side so that all ports and buttons can be exposed. Easy to install and remove too. These cradles have a dual T pattern on the back and fit the entire Arkon mounting line which features solutions for everywhere in your car or on your motorcycle of bike. The motorcycle or bike options include an optional safety strap which we strongly recommend using. RAM has also come out with a nice solution called the X-Grip IV, their model number RAM-HOL-UN10BU. The X-Grip IV expands to 4.5 inches wide. It’s different from the Arkon model in that it grips the phone from the sides versus the bottom and top. The X-Grip has four legs that are spring-loaded to squeeze around the sides. You may need to maneuver the phone to ensure the volume buttons aren’t exposed. Ports from the bottom and top can be accessed without a problem. These come with a one inch ball which attaches to their RAM-B-201 line of arms. RAM has a nice shake test on these in case you are worried about it falling out, take a minute to check it out. They are quite secure and come with a lifetime warranty. The RAM site lists a bunch of phones that fit this model which I won’t paste within since the list always changes. As long as the phone is between 1.75 and 4.5 inches it should fit well.